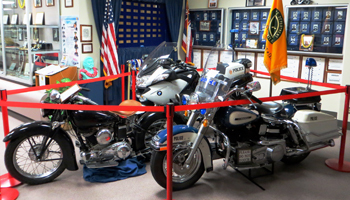 The Honolulu Police Museum: More Than 100 Years of Law Enforcement History. 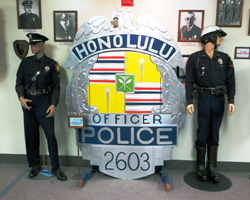 The Honolulu Police Museum: A History of Protecting Paradise! 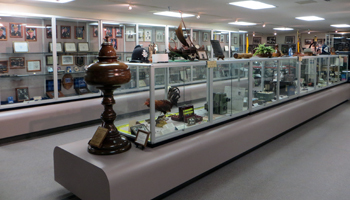 Although I imagine that the Honolulu Police Museum will hold the greatest appeal for Hawaii vacationers with a law enforcement background, you might still find this free Honolulu attraction interesting even as somebody who prefers to avoid the cops whenever possible. Maybe you grew up watching the old Hawaii FIVE-O, and you want to see how realistic that show was. Or maybe your Honolulu tourism plans just got rained-out and you’re looking for an indoor alternative. Maybe you’re just looking for things to do in Honolulu, and this will be one of many options in a full day’s itinerary of downtown Honolulu activities. Whatever your motivation for visiting, the Honolulu Police Museum could keep you busy for anywhere from 30 to 90 minutes (depending on your level of interest). It’s bigger than I expected, but not so big that you can’t easily see everything. 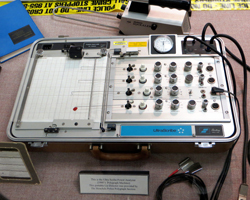 If you just want to look at neat old stuff – like 50-year-old polygraph machines, breathalyzers, forensic kits, police motorcycles, and photos, you can be in and out of there in no time. However, I found that it was worthwhile to take the time to watch their video presentation and read several of the interesting stories that accompany the various displays. Admittedly, for me, there were a lot of: “yeah, I remember that” moments; which you as a visitor probably couldn’t expect to have (unless you were here before). But even if you’ve never previously been on vacation in Hawaii (or lived here), you’re still likely to discover things that cause you to remember national news, popular television programs, and famous movies/literature – such as the real-life Honolulu Police officer who inspired the legendary Charlie Chan mysteries. 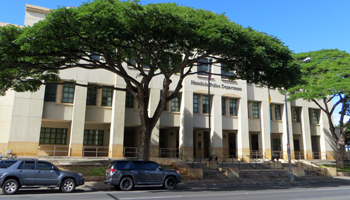 The Honolulu Police Museum is located in the main precinct of the Honolulu Police Department. There’s a limited amount of metered parking next to the building on South Beretania Street, Hale-Makai, and South Hotel Street. Or there’s a parking garage, with more metered parking, that can be entered from behind the building at the intersection of South Hotel Street and Kealamakai Street. Make sure you bring change for the meters, because otherwise you’re just begging for a parking ticket in this particular area. To get into the Honolulu Police Museum, you’ll need to walk up to the main Beretania Street entrance. Tell the officer on duty at the security station that you’re there to see the museum. Then he/she will ask at least one person in your party to leave an ID card, and he/she will direct you through one of the offices to the museum entrance. All the officers we encountered were friendly, helpful, and eager to answer questions (or share stories), so don’t hesitate to interact with whomever is present. If you’d like to request a guided tour, click this link to the Honolulu Police Museum official site (link opens a new window/tab). Now for what some will undoubtedly consider bad news… If you always make it a point to browse around a museum’s gift shop, you’re going to be disappointed here. There is no such shop. But if you’re lucky, you might find a souvenir in the snack shop at the front of the building. Personally, I was fine without the gift shop. But my wife mentioned it a few times, and I know she’s not the only person who judges a museum by its souvenirs. If you’re compiling a list of several Honolulu things to do, I’ll try to help. Diagonal across the intersection of Beretania Street and Ward Avenue to the northeast, you can visit the Honolulu Museum of Art. Just three or four blocks to the west, you can see the Iolani Palace, King Kamehameha Statue, the Hawaii State Capitol, Kawaiahao Church, and the Hawaii State Art Museum. And just a few blocks uphill (though not close enough to walk because of the circuitous route) is the National Cemetery of the Pacific at Punchbowl Crater. There’s plenty to do; so have fun.